Where is Florence going to hit next? As the storm continued its slow-moving rampage, it began pelting residents along the South Carolina coast. Tropical Storm Florence is now creeping across eastern South Carolina after cutting a deadly path through North Carolina. And because the storm, which first made landfall as a Category 1 hurricane early Friday near Wrightsville Beach, North Carolina, is crawling westward at just 2 miles per hour, officials anticipate a dangerous combination of lingering rainfall and overflowing river basins could bring unprecedented flooding after the winds die down. Along the 60-mile stretch of Grand Strand, South Carolina, which includes Myrtle Beach, 15 to 25 inches of rainfall are expected as Saturday drags on. On Friday, South Carolina Governor Henry McMaster cautioned that could mean extended power outages. "That rain and that flooding equals danger, and that means we're going to have patience," McMaster said in a press conference. "We're going to lose electricity in large parts of the state for days and maybe even weeks." After pushing through South Carolina and moving inland through the Appalachian Mountains on Saturday, Florence is expected to make a turn northward as it weakens further. Florence is forecast to turn northward through the Ohio Valley by Monday, and its remnants are expected to dampen the Northeast, including New York City, by Tuesday. While Florence was set on South Carolina on Saturday, North Carolina was not yet out of the woods: A storm surge warning was in effect Saturday for Myrtle Beach up to Ocracoke Inlet, North Carolina, and a tropical storm warning was issued for South Santee River, South Carolina, up to Cape Lookout, North Carolina. 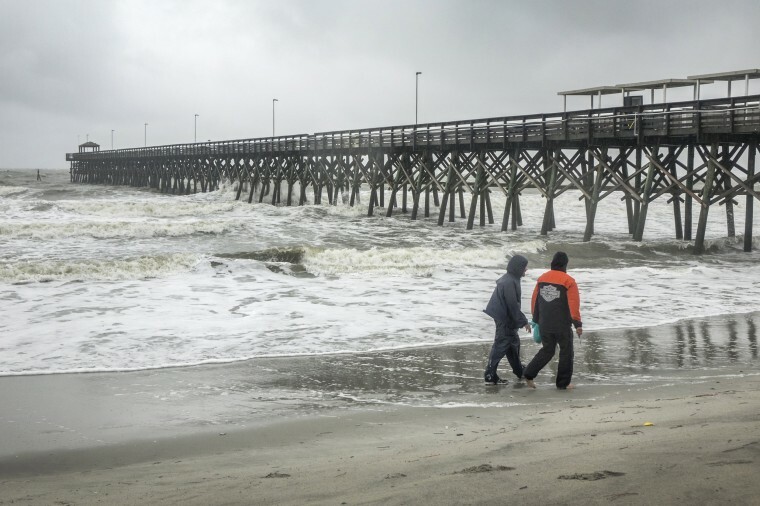 The outer bands of the storm, which is as big as the state of South Carolina, had already begun pelting Myrtle Beach with rain and winds on Friday, turning the tourist destination into a ghost-town. A city-wide curfew had been in effect from 7 p.m. Friday to 7 a.m. Saturday. "We have a pretty high number of residents already in shelters, so we’re encouraged that it seems like most people are taking this seriously," Horry County public information specialist Kelly Lee Brosky told NBC News. Some residents, however, decided to hunker down and ride out the storm at home. Brittany Michelle Robertson, 27, says she stayed with her father and stepmother in the Myrtle Beach trailer park that the family manages. By early Friday afternoon, she watched as several awnings on nearby hotels were torn down by the wind. "We stayed to just make sure that families that stayed (in the trailer park ) are okay and are safe … and if there’s any damage to make sure it’s repaired," Robertson, a preschool teacher, said by phone. "I have faith in God that we’ll be okay." Local officials warned storm surges and heavy rains would flood the road network that links low-lying Myrtle Beach to the rest of the state, effectively cutting off the city. South Carolina National Guard Adjutant General Bob Livingston told The Post and Courier that authorities are "looking at ways to get back into that area, either through establishing a route in by land or by water or by air." "If we have to, we’ll bring supplies in by helicopters or aircraft,” he told the newspaper. A Horry County official confirmed to NBC News that they were "planning for every contingency." In the nearby city of North Myrtle Beach, officials said on Friday that 90 percent of the population had already been evacuated. But the 911 emergency system was already overtaxed before the brunt of the storm, with the city public safety office asking residents to call a second number, 843-280-5511, for medical and life-threatening emergencies. As of Saturday afternoon, there were 148,943 power outages across South Carolina, according to poweroutage.us, which tracks the country's electrical power grid. The anticipated scale of the swath of destruction from Florence is bringing back memories of Hurricane Hugo in 1989, a storm that caused an estimated $7 billion in damages, according to the South Carolina state climatology office. But McMaster warned that Florence is a very different menace than any South Carolinians had experienced before — whereas Hugo had made its way across the state in a matter of hours, this storm would rampage slowly, meaning much more water would be left in its wake. "This is going to be a very trying period, this is not something we have before, but I am sure this is something we are equal to," he said.